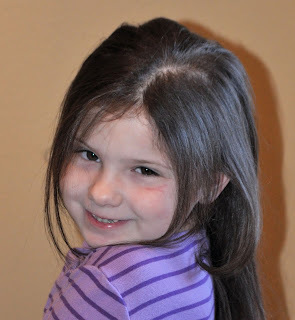 Everything was done with Stampin' Up!. I did the large circles with the Circle Scissors, and used SU punches and card stock, as well. My husband actually helped me come up with how it should open (Go, Mike!). Bradley loves them, and I'm sure his friends had fun opening them to see their own name in it. It was a great party, but exhausting! 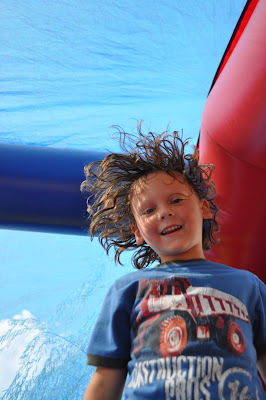 Having eight 5 and 6-year-old boys running around felt like having twenty of them. 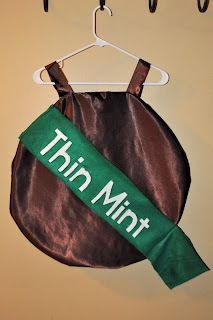 I can wrangle 19 girl scouts without issue - but those boys, wow! Bradley is already planning his next party - he can't decide between Cars 2 or Star Wars. He has plenty of time to decide! I found some Shrinky Dink plastic the other day when I was cleaning out my craft room, so I let the kids play with it. They had SO much fun tracing pictures from their books and coloring them. When they first watched them in the oven it was like watching a magic show - they were really impressed at how fast they shrunk and how it they retained all the color and detail. Did you know you can make your own shrink plastic and recycle at the same time? If you get plastic containers (like from a salad bar or take-out restaurant), check the bottom. It must be number 6 plastic and it will have this symbol on the bottom: . But, you can use it the same way - cut it out, draw on it with permanent markers (or rough it up with sand paper first to use colored pencils on it) and bake it at 300 degrees for about 3 minutes. Fun, huh? When I saw this designer paper I just knew I was going to make these for Chloe's room. It's called "Hoot Hoot" and it has the most darling little owls in it. I just painted the 6x6 canvases green, cut out the paper, and used Modge Podge to glue them down and coat them. I started with the 3, but I think I'll probably add 6 more to have a big square on her wall. She loves them, and I really like how they came out. My kids have been begging for a Lego table, but those bad boys are expensive! So, I was looking through our local thrift store and I found a great table (that I didn't take "before" pictures of because I'm a dork and I always forget to). It was ugly, dirty, dark brown, with plastic casters. But, it had a raised edge on the top and a great slanted shelf on the bottom I figured could be used to hold the Lego bins. Chloe had to do a big "All About Me" poster for school this week. (Yes, they assigned it on Monday and it is due on Friday - I don't know if I'm ready for 2nd grade!!) I let her pick out the pictures herself and she cut most of them out and used a ton of stuff from my craft room to design her masterpiece. :) If you have school aged kids, every time Hobby Lobby has their stickers on sale for 50% off, buy some! Chloe goes through a ton of them every year. I think she did a great job. The card stock, ribbon, and glitter (Dazzling Diamonds) are Stampin' Up! and I cut the shapes and layers with my Cricut Straight From the Nest and Elegant Edges carts. I got this idea from Zoot and I love it! A new first day of school tradition has begun. The kids worked on them last week and were pretty excited to show them off. I still can't believe how big they are. Daddy walking them to the building. Chloe did great - she gets to sit at the same table as one of her Girl Scout sisters. She was all, "Mom, you can leave now." Whatever! But Bradley, on the other hand... I wasn't prepared for him to cry. 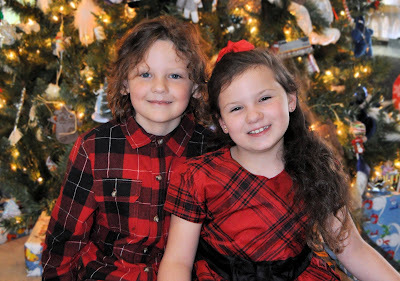 He had been in private pre-school and pre-k, he knew his teacher (she was Chloe's kinder teacher and he wanted to be in her class badly), he had a friend in the class, too. But, he cried and whispered for me not to leave him. So, of course, I had to desperately fight back my own tears. We had quite the puddle of sadness going on before Daddy swooped in to make everything better. Then I had to rush off to my own campus all raccoon-eyed to welcome my own students back. Tomorrow will be better, right? I made a whole bunch of these to give to the kids' new teachers in a few weeks (still cannot believe the summer is nearly over). I used my Cricut and the Doodlecharms cart for the shapes (except for the pencil that's an original design). Card stock, ribbon, designer paper, and punches are all Stampin' Up! He totally played with that flour for over two hours. 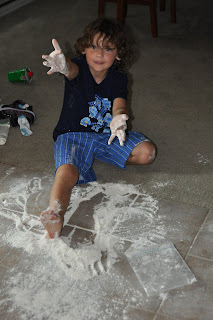 Yes, he made a colossal mess, but he cleaned every speck of it up on his own. He had a wonderful time that I'm sure he won't forget. 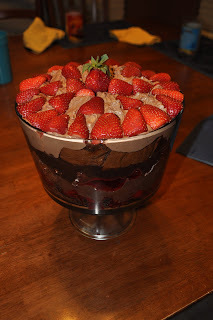 Completely worth the lingering smell of bakery! 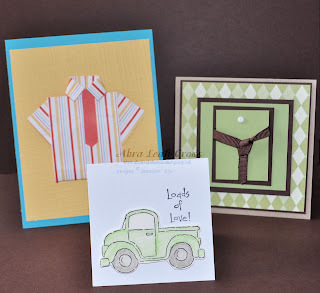 I had scheduled a Father's Day Card workshop several weeks ago, before my father passed away. I went ahead and held the workshop, but it was a bit surreal. The guests had a great time, though, and the cards were really fun to make. My kids made some for their daddy, too, after everyone else left. 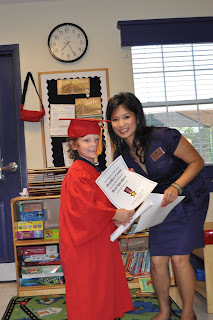 Today my sweet little boy "graduated" from pre-k. I seriously cannot believe he is going to be in Kinder in the fall. How the heck did I let this happen? The program was darling and Bradley got his little diploma and an award for being the Best Speaker (imagine that). And this is him with his "girl friend" - they've been friends for over 2 years now and will be in the same school together next year. 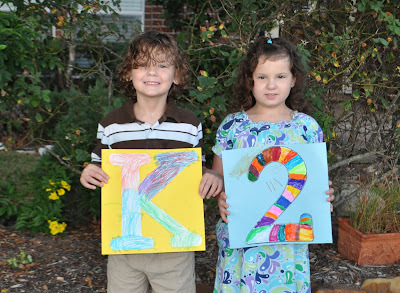 They adore each other and are hoping and praying they get to be in the same class for kindergarten. Her mom and I think it will be cute to take another one just like this when they graduate from high school together, but that is something I cannot even imagine right now! Galen Southwick of Missouri City, Texas went to be with our Lord on Sunday, May 15, 2011, at the age of 66. Here's a bonus picture of someone who was waiting for us near our campsite. Yikes! The joys of camping!! 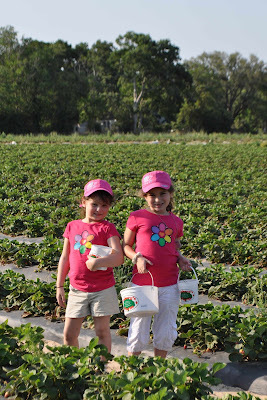 My Girl Scout troop used some of their cookie money to take a field trip to a local strawberry patch today. They got a little tour, learned how they grow the berries, and then got to pick their own little buckets full. They ended the trip with delicious homemade strawberry pies and they made their friendship circle around a 200-year-old pecan tree. Another successful girl scout day! One of my friends is having a pirate themed baby shower - adorable, right? So I had to make her a card worthy of such a fun event. 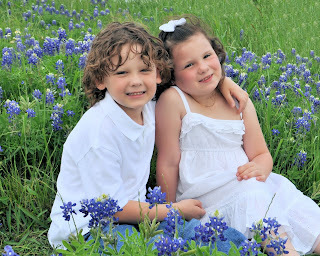 Instead of trekking all about the country this year, we found an amazing bluebonnet patch about 5 miles from our house! I scouted it every day to see when there was lots of blooms and we were able to get some fantastic pictures. In honor of Girl Scout Week and the 99th Birthday of Girl Scouting, my Girl Scout troop researched how many teachers at their school used to be girl scouts. 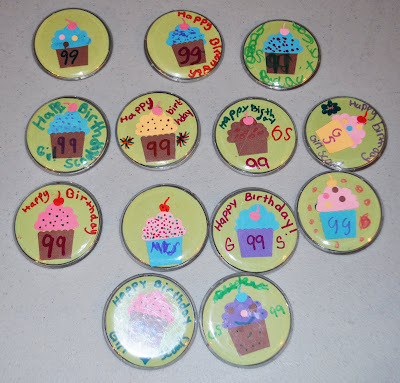 Then, at our meeting they made each teacher a button to wear during Girl Scout week to celebrate "once a Girl Scout, ALWAYS a Girl Scout." We got a ton of positive comments from the teachers and many of them wrote us stories of their special Girl Scouting memories. It was really sweet - I can't wait for next year and the 100th Year celebrations!!! I hope 2011 brings you blessings! Time to get this rowdy group to bed!